London's leading shares hit a fresh intra-day high on Friday as sterling wobbled on election uncertainty. The pound initially fell but then inched up 0.01% against the dollar at $1.288 but was 0.52% lower against the euro at 1.143 euros. Recent opinion polls have cast doubt on earlier forecasts of a landslide win for the Conservatives on 8 June. 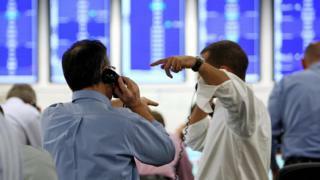 The FTSE 100 hit a new peak of 7,598.99 before falling back. It ended the day up 3.86 points or 0.05% at 7,547.63. A weak pound tends to boost the 100-share index, since many of the firms included are multinationals that derive much of their revenues from abroad. These overseas sources of income are worth more when translated into sterling, thus boosting their profits. However, mining stocks, which tend to dominate this category, had a mixed performance. Fresnillo was among the gainers, up 3.7%, but Antofagasta and Anglo American both fell, down 1.5% and 10.4% respectively.